People are always asking us: ‘Who is the Official Texas High School Football Team of Warhorses of Letters?’ There will be some people who think we don’t even have an Official Texas High School Football Team, because we are English authors who write comedy series about gay horses, but those people don’t realise that one of us is obsessed with American Football in general and with Friday Night Lights in particular, and the other one of us is obsessed with Friday Night Lights in particular. Anyway, the Official Texas High School Football Team of Warhorses of Letters is, obviously, the Devine Warhorses, which is a bit how Copenhagen and Marengo think of themselves. And last Friday the Warhorses kicked the asses (a horse joke) of the San Antonio Sam Houston Hurricanes in the first round of the play-offs. We love the Warhorses, and we are big Joseph Sadler fans. Sadler is the Warhorses’ star running back. He is putting up cartoonish numbers (he rushed for 466 yards IN ONE GAME against Hondo). He is on the verge of a single season points-scroing record and is up there on yards and TDs too. Go Joe. Or Goseph Joseph, if you don’t like your name being shortened. We don’t know, but we assume that Warhorses of Letters is the Official British Radio Comedy of the Devine Warhorses. When we are not busy pretending to be horses, we do other things, such as talking to people about what it’s like pretending to be horses. We did one such thing here, for the website So So Gay. (The technical term, for those outside the trade, is an “interview”.) My favourite thing about it, aside from all the funny things I said (I am protected by the anonymity of being both Hudson and Phillips right now), is the fact that the subeditor felt the need to differentiate Hudson from Phillips in the photo at the bottom of the page. Speaking for both Hudson and Phillips, I think that’s a little harsh. 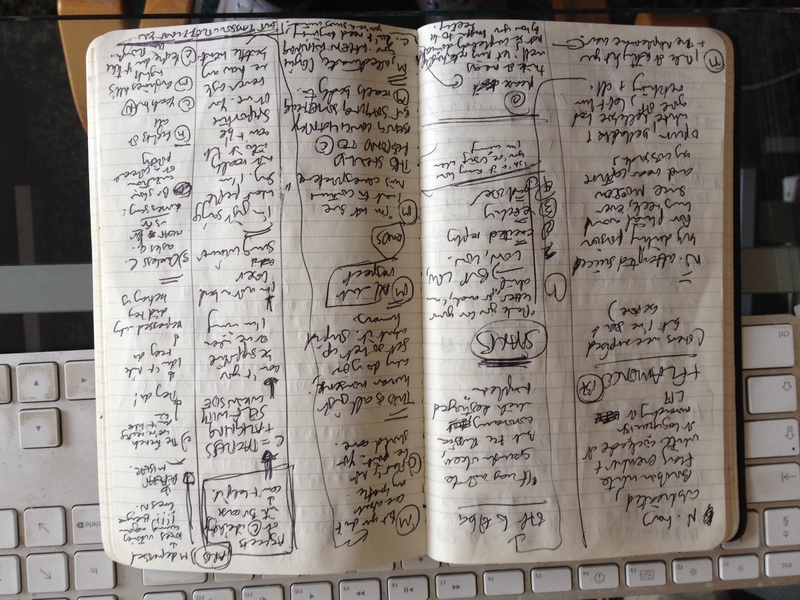 As you may be able to see through the haze of my penmanship, these were our first notes towards last night’s episode. As you can also see, I won’t clean my keyboard just because some people tell me to, Ben Johncock. As you probably can’t see unless, the nature of editing letters, and of life being learning, means that two of our very favourite jokes in the whole Warhorses of Letters canon didn’t make it onto the air. If you need yet more reasons to buy the book, let that be one. I said on Twitter last week that The Saucy Episode of Warhorses would feature a special guest joke from Mark Evans, editorial decisions permitting. Well, the editorial decisions did not permit. Thus the special guest joke will only be available to book buyers and people who come to Tall Tales. * Probably only for a quite limited value of ‘interesting’. UPDATE 2, RE: ALL OF THE BELOW: Apparently it’s a bug on the site. They are working on sorting it out, but for now, if you get charged too much, try updating your basket – it should then show the correct price. Sorry to anyone who tried to buy a signed hardback and was charged £20 instead of £15. The problem has now been rectified. The Warhorses book (and print, mug, embroidered horse blanket, pony trekking trip etc) can be found here. UPDATE: It seems there are still a few issues. I’m very sorry and trying to get it sorted asap. If you’re having any problems, please drop us a comment, or an email to warhorses@unbound.co.uk. Someone pointed out that we haven’t put a picture up of the print you can buy alongside the book. This is the picture. Isn’t it great? ***NB*** It is, as the place you can buy it makes clear but we inexcusably did not until put right by various important artists who follow us, by the brilliant Tom Sears. Someone else pointed out that we hadn’t clearly pointed out that we are publishing via the excellent crowdfunding site Unbound, and we therefore need people to sign up in advance. We have made an enticing video to entice you. And if you pledge, there is more video in the members’ area (‘shed’) and there will soon be even more video than that and a song. The best question so far is about the process whereby Copenhagen was prepared for military life. No one has pointed out that if you enjoyed Warhorses of Letters and wanted to hear podcasts from the live show where it was born, you can do that by going to iTunes and searching for “listen and often” or by visiting this link. No, wait, somebody has pointed that out. Why don’t you switch off your computer and– No, wait. Everything I am going to mention is on your computer. 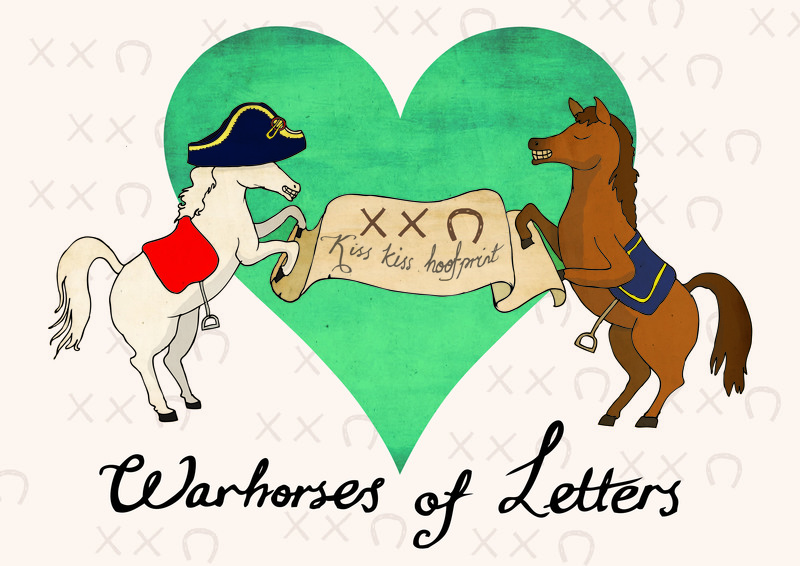 I want EVERYONE who has written anything on their blog or twitter about Warhorses of Letters to know that we appreciate it. You would have to have been spectacularly low-ranked by Google for us not to have found you. Does that make us narcissistic? Or does it mean we care what people think and are keen on making things better if we can? Who knows. We certainly liked someone getting the Flashman reference. Anyway, episode two is tonight. We hope you like it. Before it airs, we are doing an interview with So So Gay. Horse and Hound? Are you out there? Oh, one other thing: we’re on the recommended list for an Anthropomorphic Fiction award. Didn’t know there was such a list. Excellent. Incredibly, no one from Horse and Hound has interviewed us, even though literally a person on one of its forums knows about the show. Anyway, who cares about Horse and Hound, just because it was on Notting Hill? This is the future, people, and we are into social networking, and what is the biggest social networking site for horse lovers? I am not sure, but the social networking site for horse lovers which says ‘Don’t miss Warhorses of Letters‘ is Trot On, and so, as far as we are concerned, that is the social networking site for horse lovers that Copenhagen and Marengo would recommend, and they can put that on a t-shirt. So, the first episode is out! Hopefully if you are here that means that you liked it, unless you are a vegan terrorist or horse homophobe on the rampage. Anyway, we thought this would be a good time to mention some fun you can have with the forthcoming Warhorses of Letters book. In the book, we’ll be publishing the uncut letters (they were trimmed a bit to fit the 15-minute radio slot so there are extra jokes you have not heard), as well as additional correspondence, learned hoofnotes and a Thrilling Bibliographical Essay. But because we’re being published by Unbound, who use an innovative pre-publication crowdsourcing model, the text of the book has not been finalised yet, which means you can still affect what goes in. If you have any questions about the series, the story, the characters, what Marengo’s favourite cheese is*, if there is anything at all you want to know, you can email us at warhorses@unbound.co.uk. If we answer your question in the book, we will upgrade your purchase – so if you’ve ordered an ebook, we will send you the hardback, if you’ve ordered the hardback, we will send you a personalised signed copy, and so on. All the details of the book and how to submit your question can be found here. *That was a joke for regulars at the Firestation Book Swap. The answer, obviously, is Manchego, only he can never reveal it, because it’s a Spanish cheese.